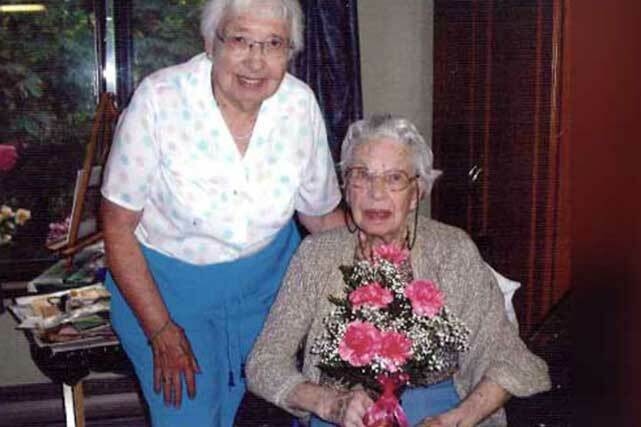 Wilma Abriel (left) with her 99 year-old aunt. I’ve been a supporter of cbm since 1998 and I want to let you know that I’ve made a gift to cbm (Christian Blind Mission International) in my Will. I’d like to tell you why. I studied Christian Education at the London Bible Institute, and when an opportunity came along to use my training, I followed God’s leading into children’s work. At that time, one hour a week of Religious Education was required in the public schools of Ontario. A nearby Mission, Christian Service Centres, hired me to teach in Norfolk County. Every week, I taught 25 religion classes in 17 different schools — covering a territory of 200 miles per week. First, I had to learn how to drive a car and navigate the icy rural roads in the dead of winter. And, I had to raise my own support from friends, family and churches. There wasn’t much financial reward but I felt the opportunity to touch the lives of so many children was truly a God-given privilege. During the summer months, I taught Daily Vacation Bible School (DVBS) in some of these same schools. It was during one of these DVBS classes that I met a girl, Launa, who was completely blind. I was stumped. How could I adapt my DVBS handcrafts so that even Launa could participate? Then, a crazy idea came to me. That night, I took home with me a Bible story picture of a rainbow. I knew what Braille looked like, so I took a straight pin and I punched tiny Braille-like holes along the simple lines of the rainbow picture. I was thrilled. I had shown a blind person a rainbow! The memory stayed with me and God used it to change the direction of my life. There I was, an instant mother, sharing the duties with another house parent on the intermediate girls’ floor. Besides caring for the blind and low-vision girls and teaching them to care for themselves, we mended clothes, darned socks, and supervised homework and recreational activities. I even came up with a way to teach the girls how to knit! Kevin Avery, from Newmarket, was one of the blind students who lived in residence there, too. About six weeks ago, I met him again at a cbm-benefit concert in Brantford. He tells me he works in the Talking Book Library at cbm, editing the audio tapes. Talking to Kevin brought back so many wonderful memories. I worked at the school for 26 years during which time my title was changed to Residence Counsellor and my responsibilities underwent many changes. I always felt it was a special privilege God had given me to work along with others in teaching and having fun with all the children who were blind. These children became very dear to my heart. So, during my retirement, when I decided that it was time to put my affairs in order, I was quick to include a gift to cbm in my Will. I have been single all my life, and now I only have my Aunt, my brother, and my niece and nephew left. I have given them each an important place in my Will, as well as a few close friends. But, most of all, I want to help children who are blind in poor countries. They are my life’s passion. I want to use my legacy gift to give back their precious eyesight to as many children as possible. I want to save children’s sight, and if they can’t ever see again, to help educate them. I want them to know how to care for themselves and how to earn a living. It was such a joy for me to help Launa, the first child who was blind I had ever met. Then, for 26 years, I had the satisfaction of ‘mothering’ hundreds of girls who were blind at the W. Ross MacDonald School for the Visually Impaired. I feel so good knowing that through my Will, I can help many more children who can’t see. I can’t imagine anything more satisfying than knowing that the gift in my Will means that someday many, many more children like Launa, will have the joy of ‘seeing’ the beauty of a rainbow for the first time!